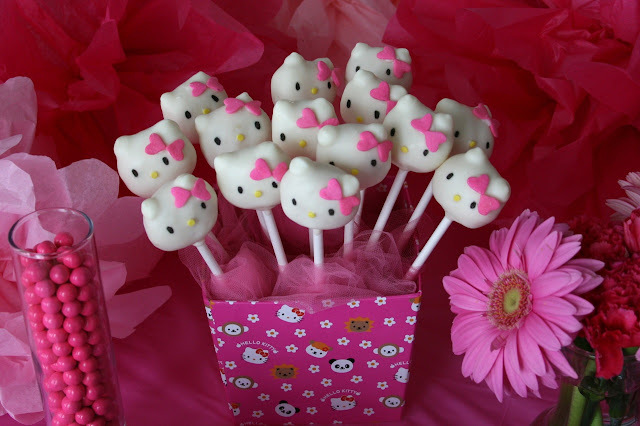 As I was looking around online for Hello Kitty party ideas last month, I came across Bakerella's Hello Kitty cake pops. Seriously cute. And I knew I had to try to make some. I am definitely not an expert dipper or candy maker, but we had lots of fun making these. I used lemon cake inside and Wilton white candy melts on the outside, along with the Wilton pink heart sprinkles for the bows and small yellow circle sprinkles for the noses. I wasn't exactly sure how I'd display them (because they're pretty top-heavy!) So I used a H.K. box container from Target's Dollar Spot, put a styrofoam block inside and then covered that with tulle. A whole box of kitties! 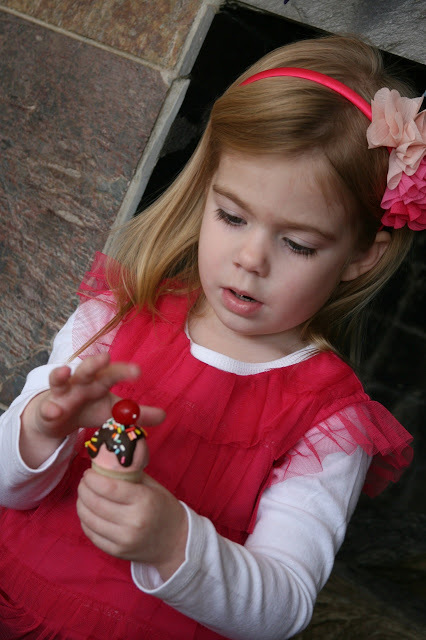 The birthday girl was seriously into these sweet treats. 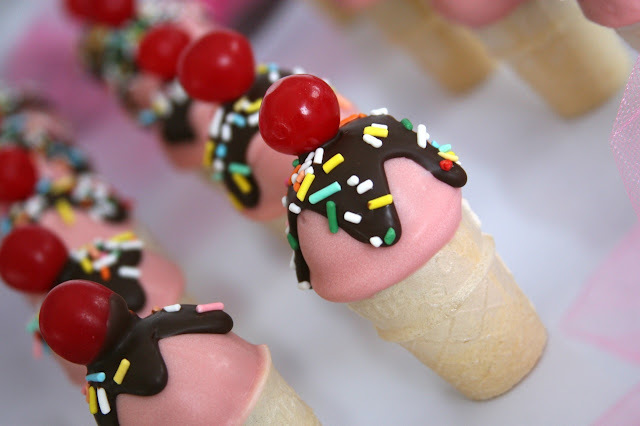 And then, I fell in love with Bakerella's ice cream cone cake pops. They're just too amazingly cute and tiny. So I had to make these, too. I used cherry sours on top and the cake inside was chocolate. The tiny 'kid cones' are from Target. 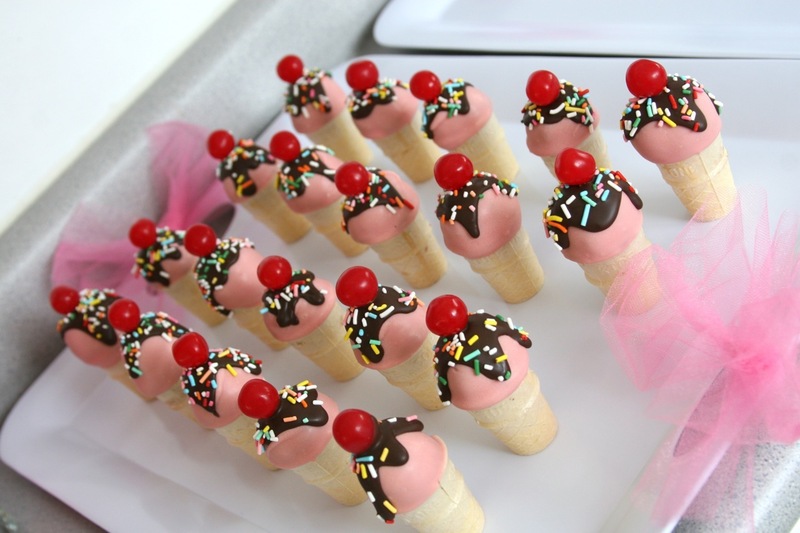 These were a hit with the kids, especially when they'd try to figure out if they were going to be eating ice cream or cake. It was so much fun to watch them take their first bite. Tricky, tricky! So, yes – that was my first adventure with cake pops. 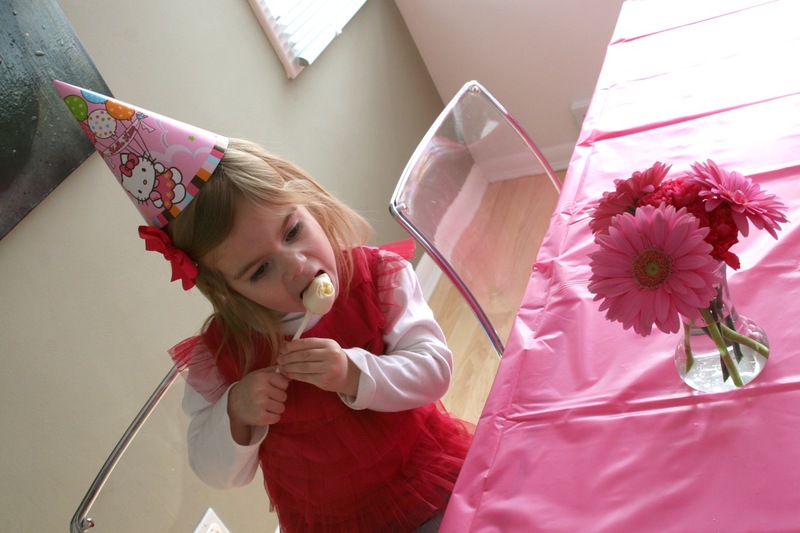 I did practice before the party to hone my candy dipping skills, and that was probably smart. I also prepped the actual cake balls a week ahead and froze them in plastic containers, so all I had to do the night before the party was dip and decorate them. A couple of things I learned: Cake balls turn out better if you trim off the darker edges off the sides and top of the 9x13 cake before you crumble it into a bowl. And, the Wilton Food Writers I used for H.K's eyes kind of sucked for this project. The candy coating was too slick for them to write on. (Next time I'd definitely try these instead.) 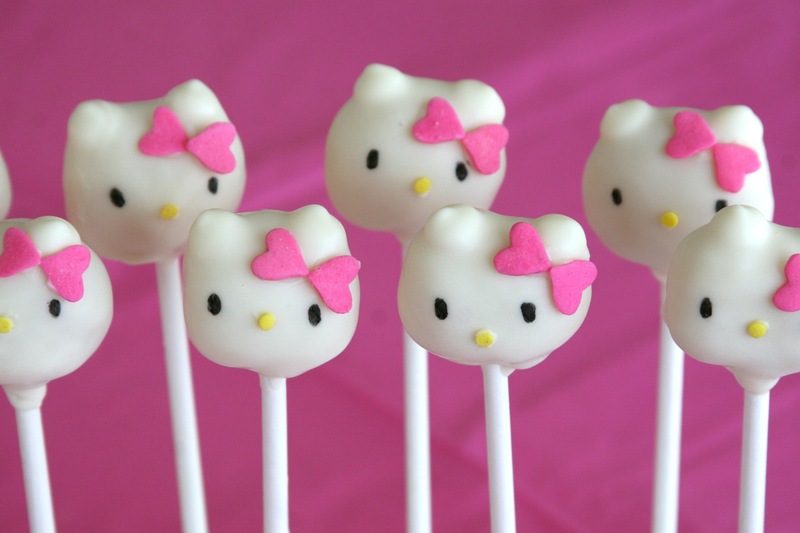 But, cake pops (Bakerella style) were definitely super fun and if you haven't made them before, you really really should. Yum. So fabulous Jen! 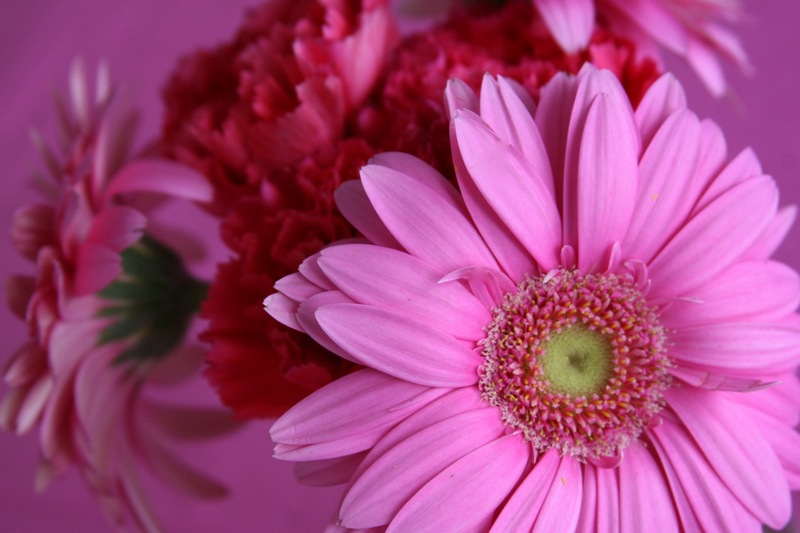 What an amazing birthday you created for your cutie girl! Can't believe you made all these at home. They look like perfection! I love love love your sweet treats. The little ones must have been in heaven! O.M.G. You are so talented. 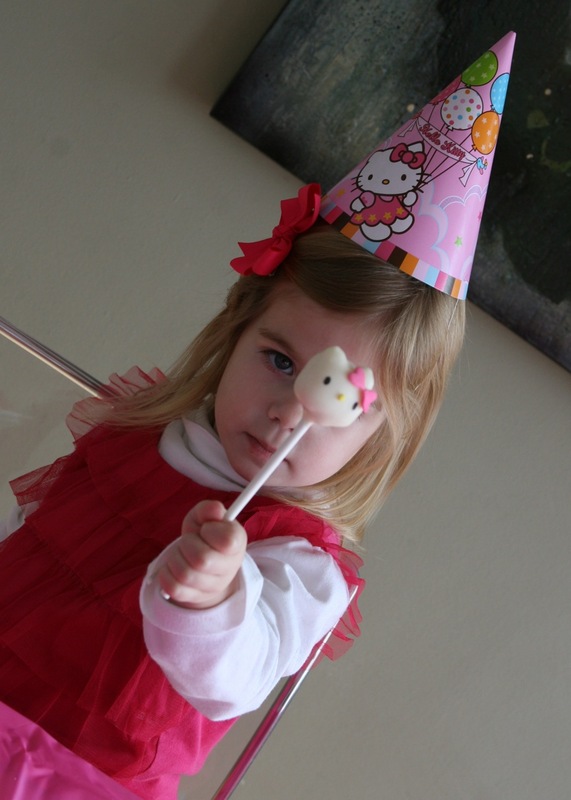 I thought the Hello Kitty pops in the box (the ones you made) was a picture from Bakerella's website?!?! AND the little ice creams cones?!?!? Love them! A+ indeed! you are SUCH a cute mom!! !